The most captivating basketball game of the past half-decade, at any level, on any stage, was a slog. It was June 19, 2016, a summer Sunday evening you, like 30.8 million others, surely spent in front of a TV. It was Cleveland Cavs vs. Golden State Warriors, Part II, Game 7 – Kyrie Irving’s shot, LeBron James’ promise kept. It was the unforgettable culmination of an NBA Finals littered with blowouts, turned suddenly by 48 gripping minutes into one of the greatest ever. And, by the standards being used to complain about Monday’s NCAA national title game before it’s even begun, one of the most memorable nights in NBA history was ugly. Perhaps even dull. Excruciatingly so. It was played at a mid-00s pace, the teams scoring around a point per possession, below the NBA average – and below Texas Tech’s output in each of its five 2019 NCAA tournament games. Golden State and Cleveland combined for 31 fourth-quarter points and a Virginia-esque one made basket over the final four-and-a-half minutes. So before you prematurely moan about expected drudgery – before you joke about 31-28 final scores; before you compare Virginia vs. Texas Tech to a bull ramming into a fire hydrant and dying – take a second to reflect and reconsider. Not to convince yourself that Monday will match Warriors-Cavs. But to realize that slow, low-scoring basketball has its merits. It’s one of several basketball manifestations of the scarcity principle, the reason a sport featuring some 2.7 goals per 90 minutes can be the world’s most popular: the rarer points get, the more valuable they are; the more, therefore, every possession matters. Tension heightens. Frantic excitement might dwindle, but drama lingers and builds, seizing nerves. Virginia’s eked-out, drought-ridden victories over Oregon and Auburn weren’t charming. But they were spellbinding, blink-less theater. Just like dozens of turn-of-the-century NBA playoff rock fights. And just like that legendary Cavs-Warriors finale. Of course, Cavs-Warriors had James and Stephen Curry. It had global brands. It was steeped in narrative-driven consequence that transcended rings. Monday night won’t be. Its lack of star power has already turned off casual fans. Its unsexy surface might lift potential viewers from their couches, away from TVs, leaving Virginia-Texas Tech as one of the lowest-rated title games ever. But its dramatic potential persists. Spectacles with stakes so often rise above aesthetics. Monday night has every chance to be special. Because Virginia and Texas Tech, on paper, are special teams with very little separating them. So what, exactly, does the college basketball collective mean by “ugly”? Let’s first be clear that the label does not equate to impotent offense. Or at least it shouldn’t. Over the past two months, according to barttorvik.com, Virginia and Texas Tech rank Nos. 1 and 2 out of 353 Division I teams in adjusted offensive efficiency. Without adjusting for opponent, Virginia averages 1.16 points per possession. It has scored 1.12 PPP in five tournament games – more than the NBA-wide average in any of 46 seasons for which Basketball Reference has data. So this is not about bad offense. It’s about slow, team-oriented offense, and historically elite defense that will neutralize it. Virginia wins games in the 50s and 60s because it plays at a tortoise’s pace, not because it’s significantly more effective on one end of the floor than the other. Its average offensive trip lasts 21 seconds. Its average game features only 60.6 possessions. It eschews fast breaks going in one direction and suppresses them in the other. And while Texas Tech’s philosophy isn’t nearly as extreme, the Red Raiders will be happy to plod along. At the defensive end, Virginia has been a top-seven unit nationally in each of the past six seasons. Yet Tech’s defense, on an adjusted per-possession basis, is the stingiest of the KenPom era. In the tournament, the Red Raiders have held Northern Kentucky to its second-worst offensive performance all season, Buffalo to its worst, Michigan to its worst, Gonzaga to its second-worst and Michigan State to its worst. The popular expectation is that those dominant defenses will stifle machine-like offenses on Monday. The analytically minded are a little more rational. Las Vegas says 59-58 Virginia. KenPom says 61-58 Virginia. Low-scoring, but not alarmingly so – 7th or 8th out of the 10 title games this decade. The “ugly” label, in reality, is more a subjective, stylistic assessment. The teams can score. Some folks simply don’t like how they score. If you squint, you can actually see all the ingredients of a great national championship. There are future lottery picks – Jarrett Culver and De’Andre Hunter. There are All-Americans – Culver, Hunter and Kyle Guy. There are awe-inspiring athletes – Tariq Owens and Mamadi Diakite. There are upperclassmen and underclassmen. There are brilliant coaches. The breadth of ingredients, though, obscures the excellence of a few. The lottery picks don’t jump off TV screens because they are less stars, more star role players – which is why their games will translate to the next level. Hunter is his team’s third offensive option. Don’t tune in expecting him to go for 25 points. He’s only done so once in 70 college games. The one player capable of a singlehanded takeover on Monday is Culver. He emerged late to bury Michigan State on Saturday. He’ll likely have to do more, more consistently, throughout the title game if his Red Raiders are to complete their remarkable rise. Will impenetrable defenses turn Monday into a shooting contest? The two defenses, qualitatively, are different. Virginia’s is the famed pack-line scheme. The Cavaliers rarely deny wings, instead walling off the paint and then closing hard on shooters. Texas Tech is more aggressive, jamming cutters and hassling opponents as they hurtle around on- or off-ball screens. The result, for the Red Raiders, is the fourth-best turnover rate in major conference college basketball. But Virginia’s offense, on Saturday, confronted the nation’s best takeaway defense and only coughed up the ball eight times. The likelier offshoot of Tech’s physicality is a game that becomes dependent on outside shooting. The idea that basketball is a “make-or-miss sport” is often overly simplistic. But one quantitative similarity between these two participants is that to beat them, you probably have to hit 3-pointers at a decent clip. Both force opponents into settling from beyond the arc. Of their eight non-first-round tournament foes, five have attempted more threes than twos. Both, however, also excel at contesting those threes. Both have opponent 3-point percentages that rank in the top 10 nationally, under 30 percent. One reason Texas Tech can jump into passing lanes and practically live in opposing guards’ jerseys is that it has one of the nation’s best shot-blockers as a safety net. Tariq Owens is a 6-foot-10 pogo stick and vaunted rim protector. He rejected at least one shot in every regular-season game, and affected many more. He’s also injured. Or at least he might be. On Saturday, Owens went down with an ugly-looking leg injury that sure looked like a season-ender. His knee hyperextended. His ankle rolled in a way ankles shouldn’t roll. He limped back to the locker room. Everybody assumed he’d stay there. But with around eight minutes to play, he ran back out to the Texas Tech bench. He checked back in, played a few minutes, didn’t quite look his usual bouncy self, and sat the final five. On Sunday, head coach Chris Beard said he expected Owens to play. But at full strength? Texas Tech's Chris Beard on availability of F Tariq Owens for Monday: "I expect him to be [available]. ... I expect him to play." Beard said Owens was "pretty sore" today after taking a hard fall on his leg against Michigan State. "If Tariq can play, he will." If Owens’ agility is compromised, and if he can’t race back from perimeter to rim to erase layups like usual, Tech could be in trouble. 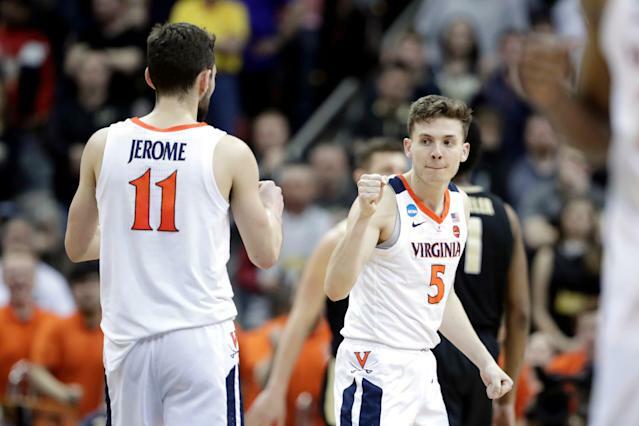 Back-screens and backdoor cuts could prove fruitful for Virginia. But if he can, Monday’s game looks like a toss-up. As tight as can be. Two evenly matched teams, matching wits for the grand prize. It might be ugly. It will be riveting.